From Goodreads: Major General Mark Graham is a decorated two-star officer whose integrity and patriotism inspired his sons, Jeff and Kevin, to pursue military careers of their own. When Kevin and Jeff die within nine months of one another—Kevin, a student enrolled in the University of Kentucky’s Reserve Officers’ Training Corps program, commits suicide and Jeff, who served in the Army as a second lieutenant, dies as a result of an IED attack in Iraq—Mark and his wife Carol find themselves reeling after the loss of two of their three children. As they begin to gather their bearings and contemplate a life without their sons, they must also come to terms with the terrible stigma that surrounds suicide in the military. This stigma is brought into high relief through the Grahams’ own experience of how their tight-knit military community marked their sons’ very different deaths. The Grahams commit themselves to fighting the military’s suicide epidemic and making sure that the families of troops who take their own lives receive the dignity and compassion that were the hallmarks of both of their sons’ lives. The Invisible Front is the story of their quest to do so. As Mark ascends the military hierarchy and eventually takes command of Fort Carson, Colorado—a sprawling base with one of the highest suicide rates in the armed forces—the Grahams assume a larger platform from which to work to reduce the stigma that surrounds mental health in the military and to develop new ways of keeping troubled troops from killing themselves. Their efforts put them in direct conflict with an entrenched military bureaucracy that considered mental health problems to be a display of weakness and that refused to acknowledge, until far too late, the severity of its suicide problem. The Grahams refuse to back down, using the pain and grief that their sons’ deaths inspired to fight to change the institution that is the cornerstone of their lives. Yochi Dreazen, an award-winning journalist who has covered the military since 1999, has been granted remarkable access to the Graham family and, as a result, is able to tell the story of Kevin and Jeff’s legacy in the full context of America’s two long wars. The Invisible Front places the Graham family’s story against the backdrop of the military’s suicide spike, caused in part by the military’s own institutional shortcomings and its resistance to change. 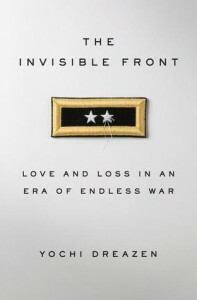 With great sympathy and deep understanding, The Invisible Frontexamines America's problematic treatment of its soldiers and offers the Graham family’s work as a new way of understanding how to minimize the risk of suicide, substance abuse and PTSD in the military. I had won this book in a giveaway a few months ago but kept putting off reading it. I wasn't sure if I wanted to spend time reading out the suicide problem in the military. I have too many loved ones who are either ex military or currently serving and the prospect was just a bit too unsettling. I'm glad that I finally read it. It was not a cheerful read, it was sobering and depressing but it was extremely interesting. It wasn't exactly the type of book that I couldn't put down but I did find myself wanting to read it which is a bit unusual for a non fiction book, in a subject that I usually would not find myself invested in. I'm glad to say that my second hand experiences with the military healthcare in regards to psych care has been better that what was reported in the book, and I would like to say that it is because of the work of the Graham family and others who are pushing for improvements within the system.